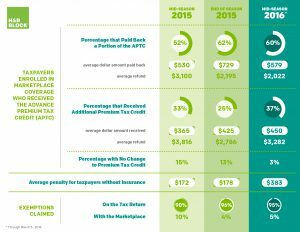 At the halfway point in tax season 2016, H&R Block (NYSE: HRB), the world’s largest consumer tax services provider, is seeing a majority of its clients (60 percent) who enrolled in a state or federal marketplace and received the Advance Premium Tax Credit (APTC) are paying back a portion of that credit when they file. The average amount paid back is higher – $579 this year compared to $530 last tax season. Refunds also are being impacted for those households without qualified insurance coverage who are paying more than twice the penalty paid last year, $383 compared to $172. This is due to the increase in shared responsibility payments set forth in the Affordable Care Act. Overall, returning and new marketplace enrollees were no more successful in accurately estimating their 2015 income than last year. In fact, 60 percent this year must repay a portion of the APTC because their household income was higher than what they estimated at enrollment, compared to 52 percent in tax season 2015. Those without insurance are paying more than twice the penalty paid last year, due to the increase in penalty from 1 to 2 percent of modified adjusted gross income (MAGI) or from $95 per adult to $325 per adult, whichever is greater. Exemptions via the tax return (compared to marketplace-based exemptions) continue to be used by 95 percent of taxpayers who are not enrolled in qualified insurance coverage but who qualify for an exemption. The most common exemptions are income below the filing threshold or income that is below 138 percent of federal poverty level when the recipient lives in a state that did not expand Medicaid. Marketplace enrollees who underestimated their 2015 income and had to repay a portion of their APTC received an average refund of $2,022, reduced from what their refund would have been otherwise. 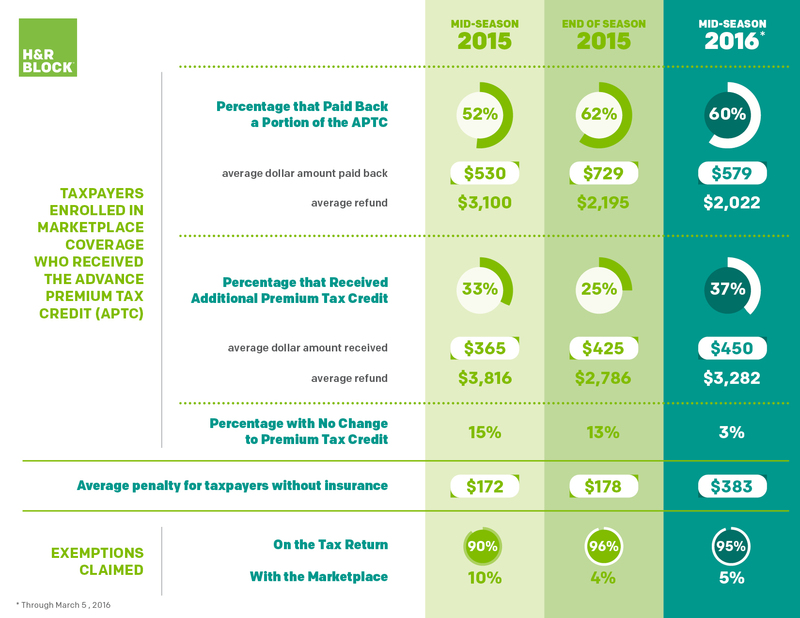 More than one in three taxpayers who claimed the APTC actually overestimated their income and therefore are receiving an additional refund –$450 more on average. Just 3 percent did not see refund impact due to APTC. Taxpayers can use an online estimator to determine how their APTC could change during the year if their income or family changes. The average penalty increased from $172 on returns filed by mid-February last season to $383 so far this season. H&R Block expected this increase and warned taxpayers about the rising penalties for going without qualified health insurance coverage in 2015. The penalty calculation increased to the higher of 2 percent of MAGI or $325 per adult. A family of four earning $60,000 this year would have seen a $975 penalty compared to approximately $400 last year. That same family could see a penalty of $2,000 next year because taxpayers without health insurance in 2016 will pay an even higher penalty amounting to the greater of 2.5 percent of MAGI or $695 per adult. Taxpayers still favor exemptions claimed on the tax return versus through the marketplace submission process by a ratio of more than 9-to-1. For these tax filers, this kept them exempt from paying that stiffer $383 average penalty. Taxpayers can use H&R Block’s ACA tax calculator to determine if they qualify for an exemption. H&R Block also reports that its clients don’t appear to be experiencing any widespread issues related to delayed or incorrect 1095-A forms. That being said, ACA-impacted taxpayers tend to wait longer to file than non-impacted taxpayers and 1095-B and 1095-C forms from insurance companies and employers are not required to be sent until March 31, which may be adding to taxpayers’ confusion. Taxpayers should also visit H&R Block’s ACA tax impact website to access easy-to-understand ACA information, infographics, videos and FAQs, as well as a tax calculator that analyzes the impact of the ACA on an individual’s specific situation.